This B&W photo was taken at sunset in Krakow Old Town Square. The silhouette is of Adam Mickiewicz, a famous Polish Romantic poet of the 19th Century. We captured this photo as a real pigeon landed to perch on his head. The silhouette buildings around him are the Krakow Bell tower and the Krakow Cloth Hall. The rooster is part of the Cloth Hall. Other silhouette photos can be found here. 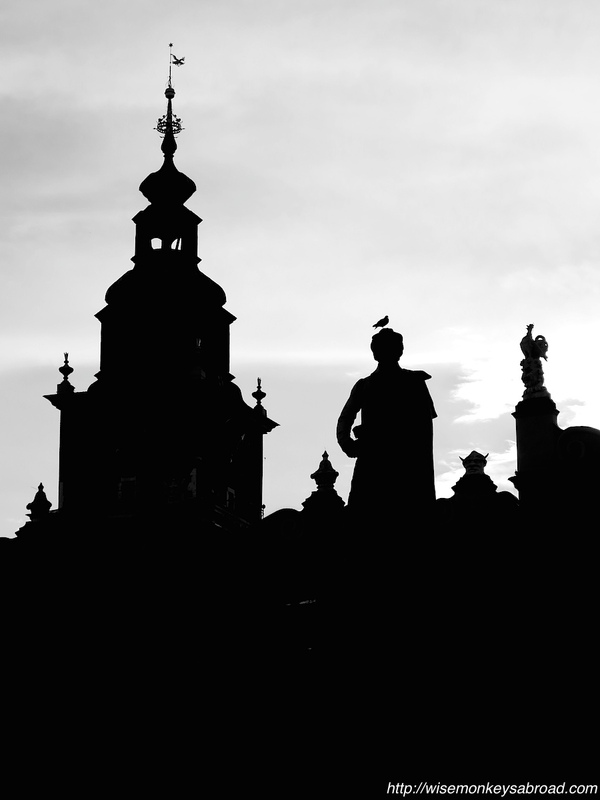 This entry was posted in Europe, Poland, Weekly Photo Challenges and tagged Adam Mickiewicz, B&W, Bell Tower, black and white, Cloth Hall, Krakow, Krakow Cloth Hall, Krakow Old Town, Monochrome photography, old town, photo, Photography, pigeon, Poland, postaday, silhouette, statue, The Daily Post, Travel, Weekly Photo Challenge. As always, an interesting and stunning post. What an amazing adventure you are on! Thanks Jane for your always supportive words! We can’t believe we are already almost halfway there 🙂 Time is flying. Hope you have a wonderful weekend. Perfect 🙂 Krakow is lovely! 😉 You make us laugh!